This post was sponsored by BODYARMOR. All thoughts and opinions are my own. I have been working on and sticking to my weight loss journey since the beginning of the year. I am extremely proud of my husband and I for sticking to this lifestyle change this time around. We have been eating more veggies, staying away from fried foods and sweets, getting more exercise, taking our vitamins, but the one thing that I have been struggling is drinking enough and staying hydrated. It has been an on going battle, but knowing that my body can retain excess water weight if I don't get the proper hydration I needs has made me want to win. 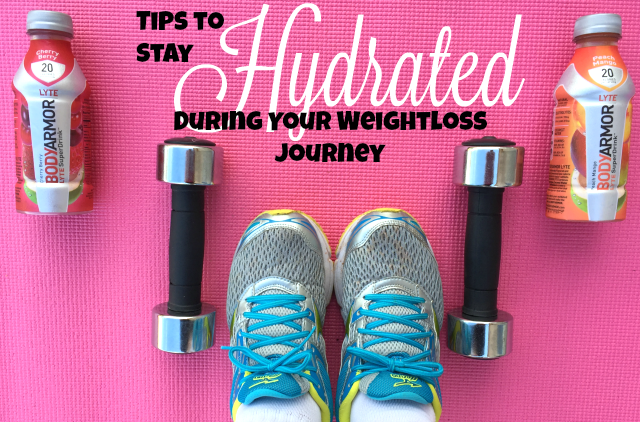 So here are so strategy tips I have collected to help me stay hydrated during my weightloss journey. 1. Use an app to track. I have been using the My Fitness Pal app to help me track my liquid consumption. It is a free app which I not only use to track how much water I am consuming, but also my weight, caloric intake, and exercise as well. 2. Drink it from a bottle. They make jugs that have the measurements marked so you can see exactly how much you are consuming. You can also mark on a bottle yourself with time oriented goals. I personally love using my personalized cup my mother-in-law made me because I know how much liquid it holds, so I can see how much I have been consuming. I also love it because it's pretty. 3. Drink water for breakfast. That doesn't mean that I just consume water as my meal. What it means is that you wake up and drink a glass of water - full 8 oz. It is a refreshing way to start the day after not drinking for 6-8 hours and it is great for your skin too. 4. Add some flavor. What I was finding as I was continually drinking water day in and day out, was that I was getting bored with plain water. 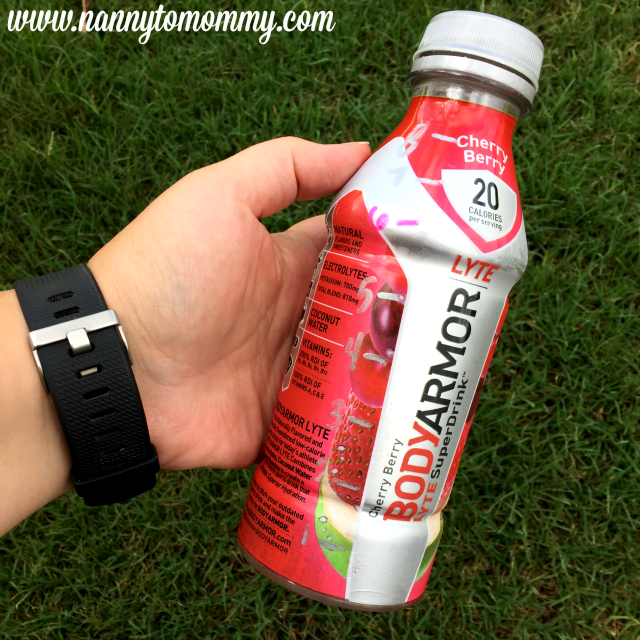 I tried many different flavor addition and even carbonated, but what is currently my favorite is BODYARMOR LYTE. It is naturally flavored, sweetened, and low-calorie sports drink that combines electrolytes, coconut water, and vitamins for Superior Hydration. 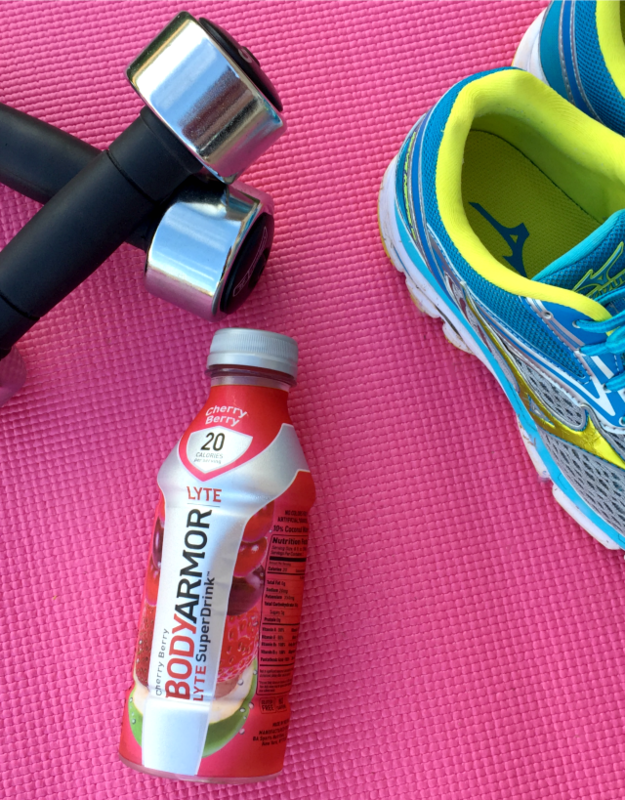 BODYARMOR LYTE has only 20/calories per serving and is the perfect drink to replenish your body after physical activity. My current favorite flavor is Cherry Berry. There is also a Peach Mango flavor as well. 5. Drink with meals. Make sure you are hydrating before your meals. I love drinking BODYARMOR LYTE before breakfast, lunch, or dinner. I always have some with me wherever I go so I can make sure to always hydrate on the go. I am able to always have it on hand because it is available for purchase at my local Kroger and Publix stores with a coupon available to print as well! Just like in your weightloss journey you have set goals, then you need to set goals to stay hydrated as well. Once it is habit, then it will be easier to stick to. Are you on a weightloss journey? Are you struggling with anything? What are some of your tips to stay hydrated? I do try each day to drink more water or liquids. I would like to try BODYARMOR LYTE also, I am sure this would help with replenishing my liquid intake. I lost 22 lbs on my journey! I would be so grateful to try this! Being a Diabetic, I am thirsty a lot! I always have water with me. I have tried those Crystal Light Flavor Packets and they are pretty good. I will try this Bodyarmor Lyte. This sounds beneficial to me. Congratulations to you and your husband on your successful journey! !